David Stephenson is an internationally recognized expert and frequent keynote speaker in the fields of Data Science and Big Data Analytics. 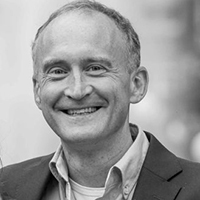 He has led global analytics programs for companies such as eBay, Axel Springer and Coolblue (a skyrocketing e-commerce player in the Netherlands). David has also worked extensively in insurance, capital markets, and financial risk management and has served as an expert advisor to leading investment, private equity and management consulting firms. David completed his Ph.D. at Cornell University and was subsequently Professor at the University of Pennsylvania, teaching applied analytics to graduate students in the engineering and Wharton business schools. David is currently based in Amsterdam.